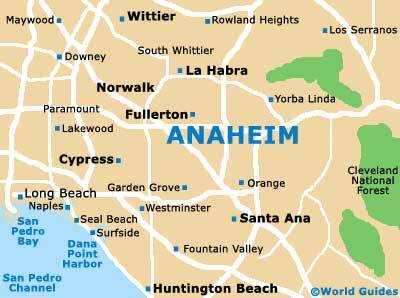 The 50 or so German pioneer families who founded the Californian city of Anaheim in 1857 would be stunned to see the present-day vast conurbation and its main attraction, the Disneyland Resort, which opened in 1955. The founding families were viticulture experts and wine-makers from Bavaria, naming the settlement the 'Home in the Valley'. 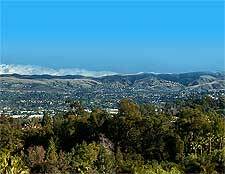 Sadly, their vineyards were destroyed after a few years by insect pests, but were soon replaced by the groves of oranges which gave their name to Orange County, as well as other citrus fruits and walnuts. By the turn of the 19th century, the settlement of Anaheim had become an extensive and thriving rural farming community centered around the orange groves, with major local landowner Bennett Payne Baxter's innovative irrigation techniques contributing widely to its success. Another delicious innovation originating in Anaheim during this period was the boysenberry, a large and juicy combination of blackberry, loganberry and European raspberry, engineered by local farmer Rudolph Boysen, after whom it is named. The railway arrived in 1887, an event which was a boost for marketing the local citrus produce of Anaheim, and by 1920, a tightly-knit farming community of around 5,500 was established. This settlement enjoyed an enviable small-town lifestyle which continued until the 1950s, by which time its population had grown to over 14,000. However, this sleepy community was about to be dragged into the modern world with the arrival of Walt Disney's dream, Disneyworld, a leisure destination for the burgeoning and affluent residents of Southern California. 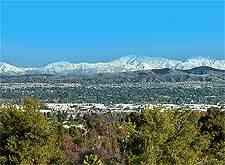 Disney's original request for an 11-acre / 4.5-hectare lot close to his Burbank studio, to be developed as an outdoor activity park for families, was denied by the Los Angeles city fathers, who were concerned about the potential effect on local residents. Taking to the roads in frustration, the movie mogul discovered Anaheim, and the result is history. As Disney's imagination ran riot, so did the project's initial costs - rising to US$4 million, an incredible sum in the 1950s, although the just-completed Interstate 5 was guaranteed to bring visitors direct from LA to the town in under an hour. Eager to agree to all municipal concerns about the quality of the park, Disney reluctantly dropped plans for a permanent circus in the complex and conceded on various other points, ensuring construction, which began on 2nd April 1954 and would be completed by the beginning of America's August vacation month the following year, thus cashing in on the peak tourist season. Magic Kingdom opened on time, with a series of disasters leading Disney to christen the day as 'Black Sunday'. However, seven weeks later, the millionth visitor entered the park and a legend was born, changing sleepy, agricultural Anaheim forever. By the 1960s, Anaheim was boomtown central, struggling to cope with a huge influx of businesses and incomers. Convention centers, a plethora of hotels, shopping malls, restaurants and entertainment venues mushroomed along with a baseball stadium supported by a son of the city, singing cowboy Gene Autry. At this time, the dilapidated downtown area was renovated. Disneyland has continued to expand and is nowadays a major world attraction, with many millions of visitors arriving each year.